BACKGROUND AND PURPOSE: There are a variety of embolization applications for nonadhesive, liquid agents. We reevaluated the potential microvascular angiotoxicity of superselective infusions of dimethyl sulfoxide (DMSO) using very long infusion rates in a previously described animal model. METHODS: Twenty-six swine underwent percutaneous femoral puncture for superselective catheterization of the artery of the rete while being continuously monitored for ECG and intraarterial pressure. Two volumes (0.5 or 0.8 mL) and three durations (30, 60, and 90 seconds) of superselective infusion of DMSO were used to evaluate the effect of a single-dose rate within an ipsilateral rete. Contralateral control infusions of normal saline were also administered. Acute hemodynamic and angiographic outcomes were assessed. After recovery, follow-up angiography and sacrifice were performed at either 10 or 28 days. Brains and retia were harvested for gross and microscopic histopathologic evaluation. RESULTS: No significant hemodynamic alterations occurred acutely. Twenty-three of the 24 infused retia showed variable acute vasospasm that typically was mild to moderate in severity and transient (10 to 20 minutes). Follow-up angiography at sacrifice always showed normal retial arterial anatomy. No adverse clinical sequelae were noted. Gross inspection of brains showed no evidence of infarction or subarachnoid hemorrhage. Microscopic histopathologic examination of retia showed mostly nonspecific changes in both exposed and control samples. Possible causal histotoxicity was seen in four retia (three of four exposed to higher dose rates), in which involvement was limited to one to three retial arteries. CONCLUSION: Lower total dose and dose rates of superselective infusion of DMSO into the retial microarterial network resulted in substantially less angiotoxicity than that found in a previous study, as defined by clinical, angiographic, gross, and histopathologic criteria. There remains considerable interest in developing nonadhesive, liquid embolic agents, such as ethylene vinyl alcohol copolymer (EVAL), and cellulose acetate for a variety of endovascular therapeutic embolization applications (1–5). Such embolic agents may have several potential advantages over currently used adhesive liquid embolic agents, such as N-butyl cyanoacrylate, including 1) no risk of inadvertent bonding of the microcatheter to an embolized vessel, 2) the ability to repeat embolization through a single microcatheter, 3) enhanced latitude in varying the volume rate and total volume delivered in a single injection, and 4) greater ability to fully permeate distal vasculature targeted for embolization. However, there are a variety of real and potential disadvantages of currently designed nonadhesive liquid embolic agents, most of which center on the use of potent organic solvents used to dissolve the polymers (1, 6–8). One such solvent that has been used extensively for such purposes is dimethyl sulfoxide (DMSO), which has previously been used for numerous topical and intravenous therapeutic applications (9–11). An earlier study aimed at assessing the technical feasibility and histotoxicity of EVAL (6) showed that the carrier solvent, DMSO, was angiotoxic (ie, results in damage to the cellular and structural elements of an artery with measurable physiological and histologic manifestations) when various volumes of 0.5 to 1.0 mL were injected superselectively into the swine rete mirabile over a relatively short period of time (< 15 seconds). Although EVAL had been used clinically on a limited basis in Japan (12–14), the findings of significant angiotoxicity associated with DMSO raised safety concerns that prevented widespread development and clinical testing of this embolic agent. Recently, a reformulation of EVAL dissolved in anhydrous DMSO has been developed (Embolyx, MicroTherapeutics, Inc, San Clemente, CA) and has undergone preliminary preclinical testing and clinical evaluation (1). That study found that slow priming infusions of small quantities of DMSO (0.5 mL injected over 30 to 120 seconds) were not associated with angiographic vasospasm or clinical sequelae in a previously described animal model (6, 15–17). Since these preliminary findings suggest that the angiotoxicity of DMSO may be dose-dependent, we set out to perform a more rigorous reevaluation of the potential angiotoxicity of small quantities of DMSO infused superselectively over relatively long periods of time using the swine rete embolization model (1, 6, 15–17). The experiments were performed in accordance with the guidelines for use of laboratory animal subjects in research by the University Animal Research Committee and the National Institutes of Health. Twenty six juvenile Yorkshire swine were used for this study. Preanesthesia induction was achieved with intramuscular injections of ketamine (150 mg) and xylazine hydrochloride (2 mg/kg). After induction, each animal underwent endotracheal intubation and was placed under general anesthesia by continuous inhalation of 1% to 2% isoflurane. Continuous hemodynamic monitoring was performed as follows. Blood pressure was measured through either a common femoral arterial sheath or a 5F guiding catheter using a standard, precalibrated intraarterial fluid pressure transducer (Spectromed, Oxnard, CA) and a multichannel analog chart recorder (Hewlett Packard, Waltham, MA). Every attempt was made to prevent transduction dampening that may occur from coaxial placement of catheters. Heart rate and ECG were continuously monitored and intermittently charted using a commercially available portable ECG monitor (Hewlett Packard) connected to a standard three-lead configuration. A 6F vascular sheath was placed into the right common femoral artery using the Seldinger technique. A 5F pediatric multipurpose coronary guiding catheter (Cordis, Miami Lakes, FL) was used to select the common carotid artery (CCA). Owing to DMSO incompatibility with certain commonly used polymers for constructing microcatheters, all superselective catheterizations were performed with either a FasTracker 18 (Target Therapeutics/Boston Scientific, Fremont, CA) or a Prowler 14 (CES, Miami Lakes, FL) microcatheter guided with a Seeker 14 microguidewire (Target Therapeutics/Boston Scientific), both of which have previously been determined to be resistant to this organic solvent. Superselective catheterization of the ascending pharyngeal artery (ie, artery of the rete) was performed by coaxial placement of the microcatheter/microguidewire combination through the guiding catheter. The tip of the microcatheter was placed distal to the pharyngeal branch of the ascending pharyngeal artery to ensure that infusions were delivered to the rete only. Superselective digital subtraction angiography (DSA) was performed with a commercially available portable C-arm/DSA system (BV29, Philips) by hand injection of 0.3 to 0.7 mL of iohexol. Preinfusion DSA was used to ensure proper positioning of the microcatheter and to study the anatomic configuration and blood flow pattern of the rete mirabile. To evaluate the variable effects of the total volume and infusion rate of DMSO on the ascending pharyngeal artery and rete, we tested two different volumes (0.5 mL and 0.8 mL) and three different rates of infusion (30 seconds, 60 seconds, 90 seconds) for each volume. Furthermore, two time intervals for follow-up evaluation of the angiographic and histopathologic consequences of the superselective infusions were used for each volume and infusion rate. This consisted of a subacute phase (ie, 10 days from injection) and a chronic phase (ie, 28 days from injection), which are intervals selected from a previous study (6). In combining the above variables to be evaluated in this study, we created 12 experimental groupings, as listed in Table 1. Furthermore, two additional control groupings with one subject each were used, consisting of bilateral sham controls (with infusion of normal saline) and a virgin rete control (ie, a harvested rete from a subject that did not undergo any catheter angiography). Serial superselective microcatheterization of each artery of the rete (ascending pharyngeal) was performed in 25 swine using standard techniques (24 swine underwent alternating superselective infusions of saline and DMSO, and one underwent bilateral superselective infusion of saline). One swine who had had no prior angiographic procedures served as the virgin rete control. The hemodynamic (blood pressure and ECG), angiographic, and histopathologic consequences of superselective injection of DMSO were evaluated using the following standardized protocol. A randomly selected rete underwent superselective microcatheterization, through which a preselected volume and volume rate of heparinized saline was infused, which was the same as that planned for the contralateral rete to be infused with DMSO. Therefore, each experimental subject served as its own internal control. Measurements of blood pressure, heart rate, and ECG were obtained immediately before infusion (ie, baseline) and were subsequently repeated immediately, 1 minute, 3 minutes, and 5 minutes after infusion. Postinfusion DSA was obtained through CCA injection at 3 minutes, in which changes in the anatomic appearance or hemodynamics of the retial circulation due to vasospasm were assessed. If vasospasm was detected, serial follow-up DSA every 5 minutes was subsequently performed until vasospasm resolved or a total of 20 minutes had elapsed. These hemodynamic and angiographic protocols were repeated in the contralateral rete infused with DMSO. A five-point grading system was used to quantify the severity of vasospasm observed angiographically. This system was derived from previous subjective angiographic grading systems used for quantifying the severity of blood-flow alterations associated with vasospasm and thromboembolic occlusion of coronary and cerebral arteries (18–21), including the system developed for the Thrombolysis in Myocardial Infarction (TIMI) clinical trials. The following grades were defined specific to involvement of the ascending pharyngeal and retial arteries: grade 0, no vasospasm; grade 1, minimal narrowing (≤ 25%) of the ascending pharyngeal artery with normal runoff and no involvement of the retial arteries; grade 2, mild narrowing (25% to 50%) of the ascending pharyngeal artery with normal runoff and no involvement of the retial arteries; grade 3, moderate narrowing (51% to 74%) of the ascending pharyngeal artery with minor or no significant decrease in runoff (TIMI grade 2 or 3) and minimal or no involvement of the retial arteries; grade 4, severe narrowing of the ascending pharyngeal artery (≥ 75%) with diminished runoff (TIMI grade 1) and vasospasm involving the retial arteries; and grade 5, profound vasospasm of the ascending pharyngeal and retial arteries resulting in loss of anterograde flow (TIMI grade 0). All subjects recovered from general anesthesia and were clinically evaluated daily for signs or symptoms of neurologic and systemic illness. These clinical evaluations, which have been described previously (6), consisted of assessment of the following parameters: lethargy, restlessness, loss of appetite, gait disturbance or lack of mobility, abnormal posturing, weight loss, guarding, inappropriate licking/biting/scratching, inappropriate vocalization, and loss of inquisitiveness. All follow-up angiographic studies were performed by bilateral selective catheterization and injection of the CCAs to assess long-term anatomic and hemodynamic consequences of the superselective DMSO and control retial infusions. After follow-up DSA, the experimental subjects were killed by lethal injection of pentobarbital (100 mg/kg), followed by immediate necropsy. Each rete was carefully harvested from the cavernous sinus as described previously (6). The retia were grossly inspected for any evidence of histotoxicity, such as thrombosis, hemorrhage, inflammatory/granulation response, and fibrosis. Each specimen was placed into 10% formalin for fixation. Standard techniques were used for preparing sections of the rete for light microscopy. Sections were stained with hematoxylin-eosin. The prepared slides were sent to two experienced neuropathologists, who evaluated the samples blinded to their status (control versus exposed). The retial samples were carefully scrutinized for a variety of possible histopathologic changes, including angionecrosis, intimal injuries, inflammatory infiltrate, granulomatous reaction, foreign body giant cells, and eosinophilia. These particular histopathologic features had previously been found to be associated with DMSO-induced angiotoxicity (1, 6–8). No significant technical difficulties were encountered (defined as an event that interferes with successful execution of the protocol) with the superselective catheterizations and infusions of the ascending pharyngeal artery. One episode of transient moderate (grade 3) vasospasm within the midportion of the ascending pharyngeal artery was encountered during a superselective catheterization. This completely resolved within 10 minutes, permitting completion of the protocol in that research subject. Furthermore, no adverse clinical outcomes were encountered. All subjects recovered completely after the infusions, without evidence of focal neurologic deficits, seizures, or alterations in behavior. There were also no anesthesia-related adverse events (eg, hyperthermia, respiratory distress, aspiration pneumonia). No significant changes in blood pressure, heart rate, or ECG were observed that could be attributable to superselective infusion of DMSO. There was considerable variation in baseline measurements of both blood pressure and heart rate, measuring between 83/60 and 150/105 mm Hg, and between 90 and 135 beats per second, respectively. This type of variability is frequently encountered in swine undergoing general anesthesia for both open surgical and endovascular procedures (22). Such variations can be attributed to natural variations in individual animals and to the frequent variability and instability in the depth of inhalation anesthesia achieved in swine with vaporized halothane or isoflurane. In lieu of the observed natural hemodynamic variability, baseline measurements of blood pressure and heart rate were obtained immediately before each infusion of saline (control) or DMSO (exposed). In the vast majority of cases, minimal changes in these measurements from baseline were noted in the range of approximately 5%. When accounting for these variations in baseline hemodynamics, and the intrinsic errors in their measurements with the devices used in this study, we conservatively estimated that a minimum of 10% change was necessary to reflect a potentially real difference in heart rate or blood pressure that may have occurred. Using this criterion, we found no significant changes in heart rate, and in only two cases were significant interval changes in recorded blood pressure noted. These consisted of a 23% average decrease occurring in a control infusion of saline (0.5 mL over 60 seconds), and a 19% average increase occurring in a DMSO infusion (0.8 mL over 30 seconds). In both cases there was substantial variability in the depth of general anesthesia, necessitating frequent adjustments in the quantity of isoflurane delivered to the animal subject. The baseline ECGs typically revealed a normal sinus rhythm or occasionally a mild sinus tachycardia. No significant arrhythmias or ectopia were observed at baseline, although several subjects had nonspecific ST and T wave changes, which are commonly seen in swine placed under general anesthesia. After control or DMSO infusions there was no evidence of increased ectopia, tachyrhythmia, bradyrhythmia, or myocardia ischemia (eg, Q waves, ST wave elevations, inverted T waves). Three minutes from the time the superselective infusion of saline was completed, DSA showed no angiographically documented vasospasm in any of the control animals. In contrast, variable degrees of vasospasm were identified in 23 of the 24 experimental subjects receiving DMSO. On average, the vasospasm was typically mild to moderate in severity (grades 2–3), with an average score of 2.8 (Fig 1). However, the full range of vasospasm scores was observed in this study (0–5). The vasospasm associated with superselective DMSO infusions was usually transient, with complete resolution in 21 of 24 animals (grade 0). In the remaining three swine, there was minimal residual vasospasm (grade 1) at the end of the 30-minute period of follow-up prescribed by the protocol. The average duration of vasospasm was approximately 18 minutes. Angiographic demonstration of vasospasm associated with DMSO infusion. A, DSA from superselective left ascending pharyngeal artery injection (anteroposterior projection) shows normal filling of the ascending pharyngeal and retial system. B, Repeat DSA from selective left CCA injection 3 minutes after infusion of 0.8 mL DMSO over 90 seconds shows grade 3 vasospasm affecting the ascending pharyngeal artery (arrow). C, Repeat DSA from left CCA injection 12 minutes after DMSO infusion shows complete resolution of vasospasm. To simplify the analysis of possible gradation effects of the severity and duration of vasospasm, the various experimental groupings were reclassified into six categories of dose rates by simply dividing the total volume of DMSO infusion by the duration of infusion. This yielded dose rate categories that varied from 5.6 μL/s to 26.7 μL/s, which permitted pooling of data (Table 2). The individual vasospasm scores, average vasospasm score, average vasospasm score at recovery, and average vasospasm duration were compared for each dose rate category. Review of this tabulated data shows a few interesting findings. First, there is a trend toward increasing severity of vasospasm at 3 minutes (as measured by the average vasospasm score) with increasing dose rate of DMSO. The range of vasospasm severity was an average score of 1.5 at a dose rate of 5.6 μL/s and an average score of 3.6 at a dose rate of 26.7 μL/s. Second, there was a similar trend observed with regard to the average duration of vasospasm, in which longer average periods of vasospasm were associated with increasing dose rates of DMSO infusion. The range of average vasospasm duration was 9.8 minutes at 5.6 μL/s and 24.3 minutes at 26.7 μL/s. Owing to the small number of experimental subjects in each group, complete statistical analysis was not possible. Follow-up angiography at either 10 or 28 days in all cases showed a completely normal appearance of the ascending pharyngeal and retial arteries. Specifically, we found no evidence of persistent vasospasm or occlusion of exposed vessels. At necropsy, all retia except one appeared grossly normal. The one exception was a rete infused with 0.8 mL of DMSO over 30 seconds, which showed a small area of focal bluish discoloration within the proximal third of the sample. This finding has previously been attributed to either thrombosis of retial arteries or subadventitial hemorrhage (6). Careful gross inspection of the harvested brains revealed no abnormalities in any of the samples. Specifically, we saw no evidence of softening, encephalomalacia, or subarachnoid hemorrhage. Microscopic histopathologic analysis showed mostly nonspecific changes that appeared randomly in both exposed and control retia. 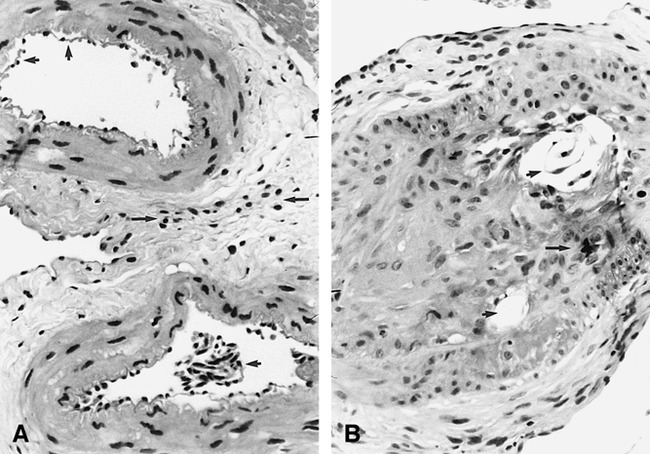 The most commonly observed nonspecific changes consisted of variable degrees of partial or complete endothelial separation and sloughing within many retial arteries, which occurred in nearly all control and exposed specimens (Fig 2A). Mild and usually focal periadventitial inflammation was also commonly observed in both control (n = 14) and exposed (n = 9) retia (Fig 2A). This finding is commonly observed in swine, and may be related to the continuity of the nasal venous circulation with the cavernous sinus (6). Also, as observed in other studies using the swine rete embolization model (6, 15–17), a few control (n = 2) and exposed (n = 3) retia were found to have occasional microscopic refractile body emboli within a single artery. These microscopic foreign body emboli occurred with or without an associated foreign body giant cell inflammatory reaction (Fig 2B). Such findings are most likely due to contaminants (eg, fibers or dust) within the saline and contrast medium that are injected through the microcatheter (23–25). Nonspecific microscopic histopathologic changes in both control and exposed retia. A, Control rete: extensive separation and sloughing of otherwise normal-appearing endothelial cells (short arrows) are seen within multiple microarteries, most likely the result of preparation artifacts. There is also mild periadventitial inflammation (long arrows) (hematoxylin-eosin, original magnification ×100). B, Control rete: endoluminal refractile bodies (short arrows) are seen in association with granulomatous inflammation and foreign body giant cells (long arrow) (hematoxylin-eosin, original magnification ×150). In only four retial samples exposed to DMSO were there microscopic histopathologic changes suggestive of angiotoxicity attributable to the infusion, since comparison of the contralateral control retia showed only the nonspecific background findings outlined above. In general, the findings were quite localized (usually to one or two retial arteries), sparing the majority of remaining constituent vessels. The most severe changes were observed in only one rete exposed to 0.8 mL DMSO over 30 seconds, and consisted of a few vessels exhibiting moderate to severe intimal hyperplasia associated with thrombotic occlusion and transmural chronic inflammation, as well as a single vessel with transmural necrosis (Fig 3A). This rete was the same sample found to have the above-mentioned abnormal gross appearance. Microscopic histopathologic changes in exposed retia possibly attributable to DMSO angiotoxicity. A, Exposed rete (0.8 mL per 30 seconds): single microartery shows extensive transmural chronic inflammation and angionecrosis (hematoxylin-eosin, original magnification ×150). B, Exposed rete (0.8 mL per 60 seconds): single microartery is completely occluded with amorphous foreign material and has focal transmural chronic inflammation (arrows) (hematoxylin-eosin, original magnification ×150). C, Exposed rete (0.8 mL per 90 seconds): single microartery shows only moderate intimal hyperplasia (hematoxylin-eosin, original magnification ×150). D, Exposed rete (0.8 mL per 60 seconds): single microartery shows evidence of focal angionecrosis and endoluminal granulomatous inflammation with foreign body giant cell formation (arrow) (hematoxylin-eosin, original magnification ×150). One rete exposed to 0.8 mL DMSO over 60 seconds had two constituent arteries occluded with amorphous foreign material and associated chronic inflammatory reaction (transmural) (Fig 3B). No angionecrosis was observed in these vessels, however. Finally, two retial samples (one exposed to 0.8 mL over 60 seconds and one exposed to 0.8 mL over 90 seconds) each had a single constituent vessel affected with moderate to severe intimal hyperplasia (Fig 3C). The rete exposed to 0.8 mL DMSO over 60 seconds also had evidence of partial angionecrosis and endoluminal granulomatous inflammation with foreign body giant cells involving the same single artery affected by intimal hyperplasia (Fig 3D). The successful development of new embolic materials for cerebrovascular applications is largely contingent upon the adequate demonstration of both technical efficacy and acceptable histotoxic profiles. As regards the development of many new nonadhesive liquid embolic agents using copolymer solutions, the potential toxicity of the carrier solvent must be taken into consideration in addition to the specific copolymer used. Some of these more promising agents (eg, EVAL, cellulose acetate) utilize anhydrous DMSO as the carrier solvent. A few investigators have previously reported significant histotoxicity associated with intraarterial injection of varying quantities of DMSO. Chaloupka et al (6) described in detail the severe clinical and histopathologic outcomes related to superselective injections of DMSO into the artery of the rete in swine. In that study, 0.8 to 1.0 mL of anhydrous DMSO injected into the retial system consistently produced severe vasospasm, which often resulted in cerebral infarction and death. Furthermore, smaller volumes of DMSO (0.5 mL) were associated with subarachnoid hemorrhage in approximately one third of cases, appearing as a delayed complication 7 to 14 days after the infusion. The microscopic histopathologic findings of these exposed retia were also dramatic, showing angionecrosis, arterial wall rupture with hemorrhage, granulomatous obliterative angiitis, foreign body giant cell formation, and intimal hyperplasia (6). Although not precisely specified in the report, the infusion rates of DMSO in that study were relatively rapid (approximately 15 seconds or less). Subsequently, Sampei et al (7) evaluated the potential toxicity of aqueous ethanol and anhydrous DMSO injected into the cerebral arteries of Wistar rats. They found that 0.2 mL of DMSO infused precisely over 5 seconds resulted in acute extensive vascular permeability and arterial wall injury. At 10 days, necrosis of the wall of the vessels and brain swelling were found. Another study by Laurent et al (8) found similar results in that rapid injections of anhydrous DMSO into the renal artery always resulted in significant histopathologic changes (ie, variable angionecrosis), whereas slower infusions into the rete produced minimal to mild changes (eg, occasional thrombosis and limited intimal injuries). A recent study by Murayama et al (1) using the swine rete embolization model confirmed the original findings of Chaloupka et al (6) in that relatively rapid infusions of 0.5 mL of anhydrous DMSO (ie, over a 5-second interval) caused immediate vasospasm and occasional death in the swine. However, when the same volume of DMSO was infused over 15 seconds, only mild vasospasm was seen, which resolved angiographically over several minutes. Slower infusions of DMSO over 30 and 120 seconds showed no significant vasospasm. The histopathologic analysis of exposed retia showed decreasing angiotoxicity with slower infusion rates. Although this study suggested that the angiotoxicity of superselective infusion of DMSO may be dose-dependent, it did not systematically evaluate this specific issue, prompting the more detailed reexamination of DMSO angiotoxicity reported here. Using the identical in vivo model of Chaloupka et al (6) and Murayama et al (1), we evaluated the potential clinical, angiographic, and histopathologic consequences of relatively slow infusions of two different volumes of anhydrous DMSO into the swine carotid rete. The two volumes selected for this investigation were based on estimations of the quantity of solvent needed to prime the dead space of microcatheters before injecting a copolymer and of the total volume of the retial microvascular bed that would be exposed to a superselective infusion. Unlike the previous studies, in which relatively rapid infusions were used, we observed no significant technical or clinical complications in the current study. Despite the lack of technical or clinical sequelae, angiographically documented vasospasm occurred in nearly all exposed retia receiving either 0.5 or 0.8 mL DMSO infused at rates varying from 5.6 to 26.7 μL/s, similar to the findings of Chaloupka et al (6). However, in stark contrast to this earlier study, the degree of vasospasm was generally much less severe (mild to moderate), and all episodes of vasospasm either completely or nearly completely resolved within the prescribed evaluation period (typically within 10 to 20 minutes). Furthermore, long-term follow-up angiography at 10 or 28 days showed no permanent alterations in the exposed retial systems. The more benign technical, clinical, and angiographic findings of the current study were further supported by the microscopic histopathologic analysis of the retia. Only a few retia (four of 24, or 17%) exposed to DMSO in our current study showed histopathologic changes that could be attributable to this solvent. These changes were similar to those described previously (6), consisting of chronic inflammatory infiltrates containing histiocytes and foreign body giant cells, mural necrosis, thrombotic occlusion (with or without amorphous foreign material), and intimal hyperplasia. However, in contrast to this earlier study, the histotoxic manifestations of the current study were far less severe in both extent and magnitude, typically affecting relatively few constituent microarteries within the entire rete. A likely explanation for the observed differences in angiotoxicity of prior studies and our current investigation is that there is probably a threshold of critical concentration that produces extensive injury to the cellular elements of exposed vasculature. In turn, this threshold is most likely related to a variety of intrinsic and extrinsic factors (eg, total volume and rate of DMSO infusion, volume of infused vascular bed, blood flow, individual vessel wall thickness, etc). The severe clinical and histologic complications related to relatively rapid superselective injections of DMSO have previously been attributed to the high diffusibility and potent solvency of this organic solvent (6). It is well known that DMSO has the ability to diffuse rapidly through tissues, which has made it a candidate pharmaceutical for a variety of transdermal delivery applications (26–29). However, this high permeability has the undesirable potential to permit extensive penetration of solvent through the wall of an exposed vessel. If large dosages of anhydrous DMSO are infused into relatively small volumes of microvasculature, the cellular and matrix components of each vessel wall will be exposed to high concentrations of this potent organic solvent, resulting in extensive cellular and structural injury. 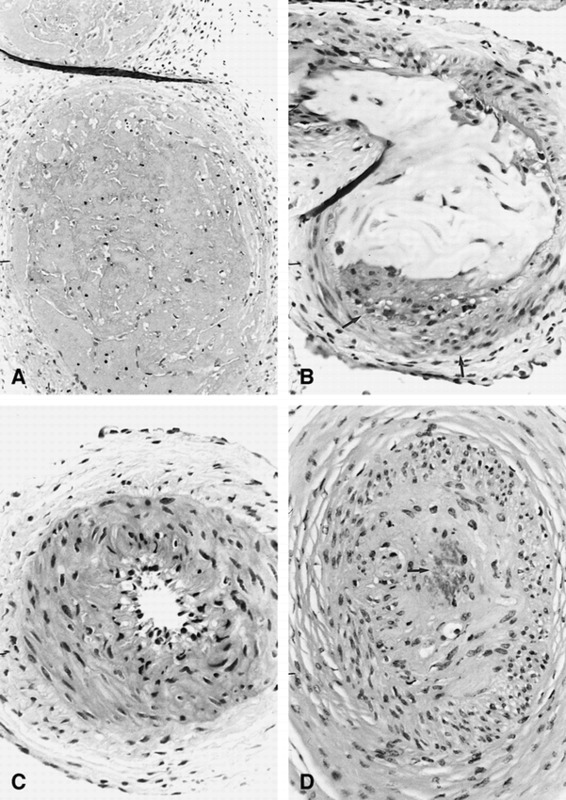 As shown by both Chaloupka et al (6) and Muryama et al (1), the consequences of reaching such a critical threshold of DMSO concentration can be profound, producing patchy transmural fibrinoid necrosis of exposed arteries that eventually can lead to either subacute rupture and hemorrhage or to a chronic granulomatous obliterative angiitis. We hypothesize that the relatively lower dose rates and small total dosages of superselectively injected DMSO used in this study prevented extensive solvent permeation and exposure of most of the retial microarterial walls, resulting in minimal overall injuries. Systemic toxicity is also possible with infusions of DMSO. Although several previous studies have generally shown excellent tolerance to slow intravenous infusions of 10% to 50% solutions of DMSO (9–11), few have evaluated the systemic effects of anhydrous DMSO. In the previously referenced work of Laurent et al (8), these investigators also evaluated possible acute cardiovascular effects of anhydrous DMSO injected selectively at different rates into the renal, common carotid, and descending aortic arteries of sheep. They found that injection durations of less than 10 seconds (ie, fast injections) of 0.1, 0.5, and 1.0 mL anhydrous DMSO produced statistically significant decreases in systemic arterial pressure, increases in central venous pressure, and a high rate of occurrence of various ECG variations (eg, bradycardia, ectopic beats, ST elevation, and high-voltage QRS and R waves). In contrast, when 0.3 mL of DMSO were injected over 60 seconds (ie, slow injection), no significant changes in arterial and venous pressure were observed, and a reduction in the rate of occurrence of ECG changes was noted (from 37% to 15%). We found no significant changes in arterial blood pressure in our experimental subjects exposed to slow injections of either 0.5 mL or 0.8 mL infused over variable time intervals of 30 to 90 seconds. In contrast to findings reported by Laurent et al, we also did not observe any significant alterations in heart rate or ECG in the swine. These differences in observations cannot be resolved unequivocally, although a few explanations are possible. One reason for the observed differences may be related to the well-known phenomenon of physiological variation among species. Although both swine and sheep are ungulates, belonging to the order Artiodactyla, their molecular and cellular biology may be significantly different with regard to cardiovascular responses to various pharmaceutical manipulations. This has been well documented in studies evaluating vasomotor responses of the retial microarteries exposed to various vasoactive substances (30–32). Another possible explanation for the observed differences in hemodynamic responses to DMSO injections may be related to technical variations in the experimental preparations, particularly regarding the administration and maintenance of general anesthesia with inhalation agents. As previously noted in the Methods section, considerable baseline variations in blood pressure and heart rate are possible during general anesthesia induced with either halothane or isoflurane. This is most likely related to the difficulty in attaining and maintaining a stable depth of anesthesia during prolonged experiments. This problem may also be further compounded by the common practice of not using nondepolarizing paralytics in conjunction with inhalation anesthesia for animal experimentation. Furthermore, it has been our experience with numerous other experimental studies with swine that a variety of nonspecific alterations in the ECG (eg, nonspecific ST-T wave changes, unusual morphology of the P and T waves) commonly occur during general anesthesia. This phenomenon was again observed in the current study. However, it was clear that these alterations were pervasive under both control and exposed conditions, with no significant changes occurring from baseline recordings that were taken immediately before an infusion. It is therefore possible that the hemodynamic lability commonly encountered with swine placed under general anesthesia may occur in sheep as well. Alternatively, it is also possible that these baseline hemodynamic variabilities noted in our experimental subjects masked any attributable alterations related to DMSO infusion. The swine rete embolization model has been used extensively in the past to evaluate the technical performance, physiology, and histopathologic consequences of various embolic agents and pharmaceuticals (1, 6, 15–17). In general, the utility of this in vivo model for such purposes has been well established and validated. However, as has been acknowledged previously, the swine rete embolization model is less than perfect in replicating the hemodynamic and biological conditions typically encountered clinically with human cerebral arteriovenous malformations (AVMs) (6, 12), since the natural configuration of the swine retial system is an arterial to arterial circulation with relatively low flow (12). Therefore, this model does not simulate the typically high flow and lower mean arterial pressures encountered with cerebral AVMs in humans. As previously described, the swine retial circulation can be modified by a relatively simple percutaneous technique to create an excellent AVM physiology model (12), although such a model may have some limitations for evaluating longer term technical and histotoxic outcomes related to certain embolic materials. The relatively slower flow within the natural retial circulation may increase the apparent histotoxic effects of DMSO by the mechanisms outlined above, therefore possibly exaggerating the actual angiotoxicity that might be encountered clinically when embolizing cerebral and dural AVMs in patients. This limitation, however, probably does not lessen the validity and potential clinical implications of the observed histotoxicity from this model, since there continues to be a trend toward performing many clinical embolizations of AVMs under slow-flow or wedged-injection conditions (33, 34). In such scenarios, it is conceivable that the distal feeding arterial pedicle, nidal vasculature, and possible small, angiographically occult nutrient arteries arising from the feeding pedicle could be exposed to similar dosages of anhydrous DMSO reached in these experimental models using relatively rapid injections. The results of our study have some important implications regarding the potential clinical applications of current and future liquid nonadhesive embolic agents in which DMSO is used as a carrier solvent. Clearly, a far better safety and angiotoxicity profile has been demonstrated for the tolerance of microvasculature to slow infusions of either 0.5 or 0.8 mL DMSO as compared with earlier studies. This confirms the preliminary findings reported by Murayama et al (1). Of course, ideally, it would be best if no angiotoxicity was elicited by a carrier solvent, such as DMSO, for any putative copolymer embolic agent. However, this expectation is most likely unrealistic and unnecessarily restrictive, since most embolic agents currently in use elicit some type of histotoxic reaction, varying from mild acute and chronic inflammation (eg, microfibrillar collagen, dextran microspheres) to intense granulomatous obliterative angiitis with foreign body giant cell formation (eg, cyanoacrylates) (35–37). Therefore, since DMSO is an integral component of certain liquid nonadhesives, it may be more appropriate to consider the net effect of the carrier solvent and copolymer when evaluating the specific angiotoxic impact of their injection into a targeted vascular bed. This is a reasonable consideration providing that 1) there is a very close temporal relationship between a priming infusion of DMSO and injection of the copolymer solution, 2) complete arrest of blood flow within the targeted vasculature is achieved during the therapeutic embolization, and 3) the priming infusion of DMSO is associated with significantly less local angiotoxicity than that of the copolymer embolic material. For some types of clinical applications (eg, therapeutic embolization of dural and cerebral AVMs) it actually may be desirable to use an embolic agent that elicits a more intense local inflammatory reaction, since the affected vessels in such cases are less likely to undergo recanalization. This potential enhancement in durability, however, may be counterbalanced by potentially increased peritherapeutic morbidity related to “innocent bystander” histotoxicity of adjacent normal organ tissue (eg, edema and swelling of surrounding brain, lower epileptic threshold). This is particularly true if a less than perfect target selectivity is anticipated. In the case of liquid nonadhesives using DMSO as a carrier solvent, an additional dimension of the usual factors affecting target selectivity (eg, technical efficacy of superselective catheterization and delivery of the embolic agent, intensity of endovascular inflammatory reaction) must be considered; that is, the high permeability and potent solvency of DMSO. Owing to these chemical properties of DMSO, it is conceivable that this organic solvent can rapidly diffuse out of the infused vasculature into surrounding tissue (eg, brain) and produce regional cellular injuries. However, the specific effects of such diffusion are largely unknown and are most likely at least partially dependent on the total dosage and dose rate of DMSO. At least on the basis of the findings of the current study, we can reasonably speculate that serious extravascular histotoxicity of surrounding organ tissues most likely would not occur with a single superselective infusion of DMSO (at the total dosages and dose rates used), given that minimal local angiotoxicity of the exposed retia (which should be most severely affected) was observed. It is possible, however, that repetitive infusions of DMSO within the same artery or a shared arterial territory may produce a cumulative histotoxicity in infused microvasculature and surrounding brain. Unfortunately, this study did not assess the potential impact of such cumulative effects of superselective DMSO infusion. Furthermore, functional toxicities of DMSO specific to neuronal tissue are also possible (38), which may occur at considerably lower concentrations than that required to produce overt microscopic histopathologic change in exposed vasculature. Finally, another important consideration derived from this study is related to the persistent observation of acute vasospasm occurring in association with superselective infusions of DMSO. Although the average severity of vasospasm encountered in this study was mild to moderate (average score, 2.8) and usually transient (which was significantly less than the uniformly severe and progressive vasospasm observed by Chaloupka et al ), a large percentage of exposed retia (eight of 24, or 33%) developed hemodynamically significant vasoconstriction (grade 4 or higher). If this phenomenon were to occur in a clinical setting, it potentially could result in technical problems when attempting to optimally deliver a copolymer solution into a targeted lesion, such as the nidus of an AVM. This hypothetical technical problem might be particularly exaggerated in the ultrasuperselective microcatheterization of distal feeding pedicles or nidal beds, in which wedged-flow control injections are used. In such a scenario it is conceivable that the catheterized microvasculature could be exposed to relatively high concentrations of DMSO, producing such hemodynamically significant vasoconstriction that delivery of the copolymer would not be possible. This type of technical problem theoretically also could translate into a clinical complication from inadvertent reflux or overinjection. Therefore, when considering clinical applications of DMSO-based embolic agents, appropriate adjustments in technique may be necessary to optimize technical and clinical outcomes. We found that slower superselective infusions of anhydrous DMSO into the swine retial microarterial network were associated with no significant clinical sequelae (hemodynamic or neurologic). Although acute vasospasm was almost always observed shortly after these infusions, both the severity and duration were dramatically less than that observed previously (6). Furthermore, blinded histopathologic analysis of the exposed retia showed very limited and inconstant possible causal histotoxicity in a minority of samples. The constellation of findings in this study suggests that lower dose rates of superselectively infused DMSO are associated with a more acceptable safety and histotoxicity profile than previously reported. Although this study provides further support for careful clinical evaluation of liquid nonadhesive embolic agents using this carrier solvent, additional safety and technical issues (eg, acute and cumulative local effects of DMSO) may need to be considered and addressed for outcome optimization. ↵1 Supported by a grant from MicroTherapeutics Inc, San Clemente, CA. ↵2 Presented at the annual meeting of the American Society of Neuroradiology, Philadelphia, May 1998. ↵3 Address reprint requests to John C. Chaloupka, MD, Department of Radiology, University of Iowa College of Medicine, JPP 3970, 200 Hawkins Dr, Iowa City, IA 52242.